Is this the website builder that time forgot? Webeden’s archaic Flash-based editor and basic feature set are no match for modern website builders. You'll be better off with almost anyone else. 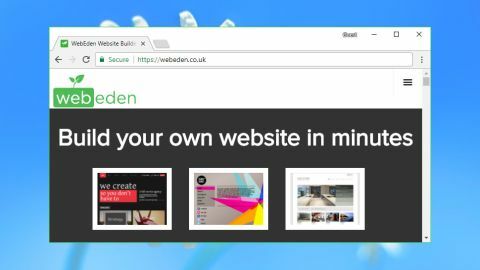 First launched more than a decade ago, Webeden is a simple website builder from the UK, but it doesn’t appear to have evolved since then. For instance, Flash player is essential not only to log in and register, but also with every aspect of your website’s creation process. If your device doesn't support Flash, or it's not installed or enabled, you're left with an empty block and a plain ‘to view this content please install Flash Player’ message from the get go. Fortunately, the sites Webeden creates don't need Flash – they're standard HTML5 – so it’s a real puzzle why they rely on such dated and insecure technology to power the front end of their service. Webeden does have its plus points. The baseline Lite plan has no bandwidth or page limits, no ads, no branding or other major hassles or restrictions. It gives you all the main editing features, allows creating a single site with unlimited pages, includes a web store which supports selling up to 20 products, and can be yours for just $3.75 a month. The $7.50 a month Standard plan gives you a free domain, allows for the creation and maintenance of up to five sites, and supports up to 50 products per web store. The $14 a month Plus plan lifts the limits to 10 websites and 150 products, and Max allows building 20 websites and selling up to 1,000 items for $23.44 a month. There are cheaper and better specified single site plans around, but if you're looking to build multiple web stores, that could appear to be good value. Webeden provides a free 14-day trial, with no credit card details required. That's reasonable, although it's worth keeping in mind that there's no money-back guarantee after you've signed up. It might still be possible to get a refund, but the small print says it's at the discretion of the company – you'll have to convince them that you deserve it. Find out the best web hosting services. As chosen by our experts. Webeden claims it makes setting up a website "quick and easy", but the reality is a little more complicated. It's good to see that tapping the ‘Let's Get Started’ button doesn't immediately display a web form demanding all your personal details, but we were less impressed that it took us back to the top of the back, to a Flash-based template selector. Get the website working and you'll find a moderate selection of 54 templates. You can browse these individually or organise them by a few categories. The viewer only displays small thumbnails of the front page. There's no way to preview the template to see if it might work for you, and worst of all, you can't simply switch templates later and keep what you’ve created – you have to start again. Once you’ve chosen a template, you're asked to enter your preferred free Webeden subdomain (yourname.Webeden.co.uk), and site name. The final step asks you to choose a username and password, and hand over your email address. Details entered, your website should have appeared in the editor, except – oops – that required Flash to be enabled, too. We were using Chrome on a Windows 10 system, so this only took a couple of clicks. Trying it out on a Mac running Mojave and Safari was effortless as well, but other users might not be as lucky. Once you're finally up and running, the template appears in its full-screen form, ready for your tweaks and customisations. The Webeden editor doesn't make a great first impression. There's a plain text menu, a toolbar packed with tiny icons, a cramped properties box that is way too small for the information it contains. It all feels more like a Windows 95 package than a modern web app. The interface makes little effort to help you. Wix for instance, does lots of cool things in this department – it changes the mouse cursor as you move over each component. Wix displays useful buttons if you left-click something, and shows you the most common option with a double-click. It also has a right-click menu with context-sensitive actions, and it supports a host of useful keyboard shortcuts. Webeden has almost none of that, instead forcing you to fight your way around a properties box, the toolbar, and other areas of the service to sort out whatever you need to do. It does have a short tutorial showing you the absolute basics (where to upload content, create a new page, delete and start again, that sort of thing). Tapping the Insert link displays an equally uninspiring selection of objects your web page can include. The core group covers the basics: text, images, links, menus, forms and a few shapes. Widgets and apps allow integrating image galleries, maps, videos, Google Calendar, a Facebook Like button, a Pinterest Pin It, and more, but the options feels meagre at best, and the computer we tested this service on really didn’t like scrolling through Flash-based menus. The editor has only the most basic of visual previews to show you what objects look like, and you won't always see those. Clicking Image Gallery just adds four empty boxes to your page, for instance. By contrast, Wix displays multiple styles upfront to help you choose the right one, includes sample images so that the page immediately works as a mock-up, and allows you to configure the gallery in a powerful visual editor. Even simple features don't always work as they should. When we selected an item and clicked on the trash can icon to delete it, the editor displayed an 'Are you sure?' type of message, but annoyingly, it cleared the screen so we couldn’t visually confirm that what we had selected was the right item. And every time we switched from one page to another, the editor asked if we wanted to save our changes. Other services typically either save changes automatically or allow multiple pages to be modified and then saved with a single action, a much more convenient approach. It's not all bad news. You do get pixel-level control over the positioning of objects on your page. The Edit menu has options to copy and paste items, send them backwards and forwards (decide which object overlaps which), align and space them. The Page manager doesn't just allow adding, copying and deleting pages, but supports creating lists and groups of users, and setting permissions to define who can see what. When it comes to media support, your options are pretty limited. Native components allow the displaying of images and image galleries, while apps can embed content from YouTube, Vimeo, SoundCloud and Spotify, but that’s about it. We also tried to upload some photos, mostly to see what the Gallery functions were like, but somehow exceeded our quota for the free trial with only four images! This was enough to see that you can’t add multiple shots in one go: you have to use the File Manager window and choose them one at a time. How very time consuming. Webeden's feeble editor ensures that even the simplest of operations becomes more difficult than it should be. Select or right-click an image in most builders and you would expect to see an option to replace that picture with another, but not here, mostly because right-clicking merely triggers a Flash player menu which bares no relation to the item you just clicked on. Instead, it seems you have to delete the first image, add a new one, then resize and reposition it to fit. There are a few other general tweaks you can make – set image transparency, pop up a full-sized image when a picture is clicked, assign it a link – but there's no image editing tool, animation options or anything faintly advanced. The editor does include an image library, although it's so small as to be almost useless: just 31 very generic pictures, and a bunch of shapes and icons. We tried some of the 'apps', but they were no more impressive. Choose the YouTube app, for instance, and surprisingly, its default example pointed at a video from the (much better) website builder, Moonfruit. Was the Webeden developer trying to tell us something? Most, if not all other website builders allow you to copy and paste a YouTube video’s URL. Not so with Wededen: you need to input only the video’s ID (the series of letters and numbers after “https://www.youtube.com/watch?v=”, which is far from user friendly. And it gets worse: the video object didn't update within the editor to show the video thumbnail. It was visible when we previewed the site, but it would be helpful if the editor showed you how each page is going to look. By default, the video’s area is square and doesn’t resize itself depending on the video’s aspect ratio - you have to do this manually, but we’re left wondering: who watches square videos? Webeden fared a little better in media management terms, with a My Files area where you can upload images you need frequently. These can then be added directly to other pages or sites, without the hassle of uploading them again. It's a welcome plus for the service, although not nearly enough to make up for Webeden's other failings. Webeden supports a simple blog which can be easily found at the top of the interface. Posts are basic, you can choose to either add text, an image, or write an article (which combines the two). In the Article, you have support for adding text, links, images and not much else. We tried to embed a YouTube video by copying and pasting its embed HTML snippets, but that didn’t work - Webeden just treated it as text, and you can't drag-and-drop any apps from the main page editor. The blog has the bare minimum of features, but there might be enough to get by. You can schedule posts, add tags, or set up a custom comments section with email alerts and optional comment modifications. Despite Webeden's feeble formatting there were still some problems. We added the blog to our site, but the editor wasn't smart enough to automatically adjust the page layout to fit, so the blog viewer ran into the page footer, and the background image made it impossible to read. That could be fixed, but only if we took manual action. Still, there is a blog, it sort of works, and having integrated comments – even as basic as this – makes it easier to get started than some more full-featured builders. At first glance, Webeden might seem to be a good choice for a web store. Even its cheapest $3.75 a month Lite plan allows selling up to 20 products. Competitors like Wix don’t give you a web store unless you're spending $12.63 a month on its eCommerce plan. But as usual with Webeden, there's a catch. The store is hopelessly underpowered, and can't begin to compare with the other major website builders. Product details are basic, for instance. Text descriptions can't contain formatting. Product options are plain text only (you can't define lists or show colour boxes). There's support for images, but not videos. You can't assign product weights. There are simple shipping rules, but nothing to deal with taxes. And so on, and so forth – you get the idea. Payment gateway support is just as limited. Webeden supports PayPal Express Checkout, and nothing else at all. There are a few mildly surprising extras. Webeden can help you set up a Facebook shop, for instance, and you're able to set up promo codes to push your products. But overall this is still a very weak web store, and you'll be much better off with almost anything else. Unlike most of the website building competition, because of its Flash-based nature, Webeden doesn't have any context-sensitive help. Instead, all you have at your disposal is the Help menu, top right, to check its various options. We started with the Beginner's Guide, which turned out to be a largely useless 15-page PDF file, which doesn’t appear to have been updated since 2009. Spend a few minutes reading the content, though, and you realise it's not very helpful at all. An 'adding videos' article explained that Webeden could embed videos from YouTube, Google Video, MySpace and Kewego, for instance. That seems unlikely when Kewego was bought out in 2011 and Google Video was effectively killed off in 2009, when uploads were disabled. And for a service which claims to produce HMTL-5 websites, it seems obsessed with FLV (Flash video) files, instead of the more modern, and HTML-5 compliant mp4. There are other signs of age elsewhere, with a 'Submit a support query' dialog asking if our online connection was through AOL, and whether we were using broadband or a dial-up connection. Put it all together and Support feels like a dusty, forgotten area of Webeden, and something no one has cared about for a very long time. It's not a resource that offers you any genuinely useful help, and if anything its many outdated references will leave you more confused than you were originally. Webeden is a very dated service, awkward to use, and with none of the power, functionality or support you would expect from a modern website builder. There's no compelling reason to choose it ahead of the competition, and plenty of very good reasons to stay well away.